Gun dealers: Why the Bureau of Alcohol, Tobacco, Firearms and Explosives inspected just 7 percent of gun dealers last year. If you’re a licensed gun dealer in America, you almost certainly don’t have anyone looking over your shoulder. 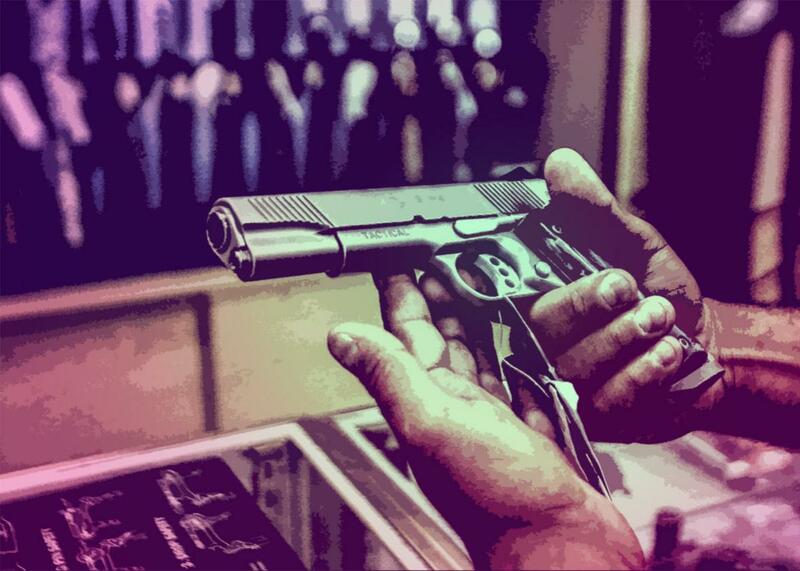 A new report found that gun dealers tend to escape the oversight of law enforcement. Photo illustration by Juliana Jiménez. Photo by Gabriel Bouys/AFP/Getty Images. Guns end up in the hands of violent criminals in many ways, and one of the most frequently cited arguments against gun control is that people who intend to use guns to commit murder will be able to do so even if law-abiding citizens who want to buy guns for legitimate purposes are forced to jump through more hoops. But the fact is that many “crime guns” are originally purchased at federally licensed gun dealers, rather than acquired on the black market. And according to the Bureau of Alcohol, Tobacco, Firearms and Explosives, a small handful of dealers—just 1.2 percent—are responsible for supplying more than half of them. To be clear, this doesn’t necessarily mean these dealers are knowingly colluding with criminals—lots of crime guns are bought by “straw purchasers,” who pass them on to traffickers and who are not always easy to identify—but it does suggest something’s not working. An eye-opening report from the Trace—a new website that specializes in coverage of gun issues—reveals why these gun dealers tend to escape the oversight of law enforcement: Last year, just 7 percent of the 140,000 licensed gun dealers nationwide were subjected to ATF inspections. According to the Trace, oversight rules prevent the ATF’s 780 inspectors from checking in with a given dealer more than once a year unless they have a warrant to do so. But in reality these inspections happen even less frequently than that: Though the ATF has set a goal of making sure that every dealer in the country is inspected every three to five years, statistics show that in 2013, just 42 percent of gun dealers had been subjected to an inspection in the previous five years. Furthermore, the Trace reports, the process of following up with dealers who have raised flags during inspections is extremely drawn out: When ATF inspectors found that a gun dealer outside of Milwaukee was missing records on 145 guns, budget constraints caused investigators to wait five whole years before making a return visit. Businesses in other industries with implications for public health are subject to tougher oversight. The Food and Drug Administration (FDA) inspects tobacco retailers as many times a year as it sees fit. The same goes for alcohol retailers, which are inspected by the Tax and Trade Bureau (TTB), a division of the Department of the Treasury. The U.S. Drug Enforcement Agency (DEA), which regulates pharmaceutical manufacturers, is able to periodically audit registered controlled substance storage locations and laboratories across the country with no prior notice. It also enjoys wide latitude to shut down rogue Internet pharmacies.